Hydraulically driven fan runs only as needed for efficient cooling, reduced noise, and lower fuel consumption. Boom float allows easy back dragging for finish grading and cleaning up jobsites. Unique stereo steering makes this compact loader even more productive, for tight turns and extra agility in close quarters. 100-percent front differential lock is easily activated through a pushbutton on the joystick. Manual low-speed differential lock delivers the traction needed to go deeper into the pile for bigger bucket loads. Unlike comparable-size machines, return-to-dig is standard. 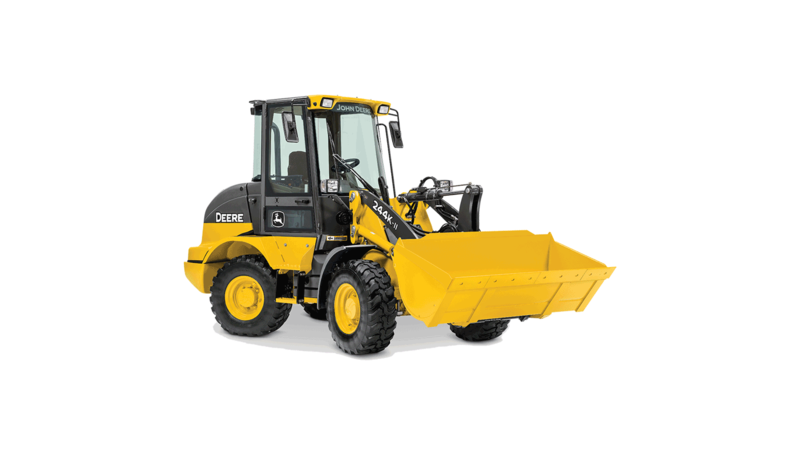 The optional pushbutton-activated skid-steer-style coupler that lets you connect and release attachments quickly, without tools or leaving the seat.